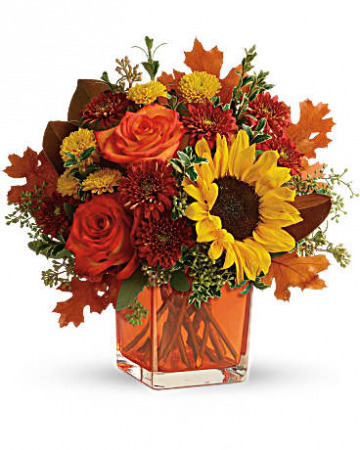 Greet the new season with this heartwarming sunflower and rose bouquet, presented in a cheerful orange cube vase. 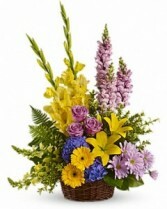 This bright bouquet includes orange roses, yellow sunflowers, gold cushion spray chrysanthemums, rust cushion spray chrysanthemums, seeded eucalyptus, oregonia, and magnolia leaves. 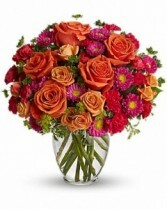 With dignity and grace, brilliant red carnations express the depth of your heartfelt feelings, and the tenderness of your everlasting devotion. 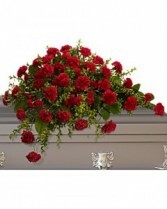 A classic half-couch spray of red carnations set against oregonia and salal, perfectly fitting for an open or closed casket service.